I now have an advance copy of Perspecta 41: Grand Tour. 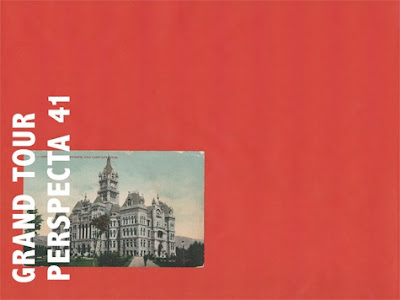 Perspecta, of course, is the oldest student-run architecture journal. It has been the proving ground for many seminal and controversial essays in architecture criticism, such as Robert Venturi's "Complexity and Contradiction", Eisenman's essays on Giuseppe Terragni, and many, many more. The Grand Tour was once the culmination of an architect's education. As a journey to the cultural sites of Europe, the Tour's agenda was clearly defined: to study ancient monuments in order to reproduce them at home. Architects returned from their Grand Tours with rolls of measured drawings and less tangible spoils: patronage, commissions, and cultural cachet. Although no longer carried out under the same name, the practices inscribed by the Grand Tour have continued relevance for contemporary architects. This edition of Perspecta—the oldest and most distinguished student-edited architectural journal in America—uses the Grand Tour, broadly conceived, as a model for understanding the history, current incarnation, and future of architectural travel. Perspecta 41 asks: where do we go, how do we record what we see, what do we bring back, and how does it change us. This current issue of Perspecta (designed by Rachel Berger and Lan Lan Liu) is printed with a high-visibility red cover. Each cover features a a different souvenir postcard, overprinted with the issue name. Contributors include Yuichi Yokoyama, Michael Meredith, Gillian Darley, Robert Venturi and Denise Scott Brown, Brook Denison, Helen Dorey, Dietrich Neumann ... and be sure to check out contributions by fellow geeks AUDC, Sam Jacob, and Matthew Coolidge. Ljiljana Blagojevic's essay on wartime Belgrade is also quite good. I also have a piece in Perspecta 41, called "Erich Mendelsohn at War". So thanks to Gaby, Rustam, and Thom for a great issue. super major props, enrique. phenomenal work! What's That Sound? It's Centrifugal Space!